The New DocuSign Experience is the next generation of our user experience and combines the benefits of DocuSign’s powerful digital transaction management platform with a highly visual and intuitive interface. Start sending documents for signature instantly from your computer, mobile device, DocuSign templates or from popular cloud storage solutions. Streamlined steps help you prepare and execute electronic signature transactions easier and faster than ever. 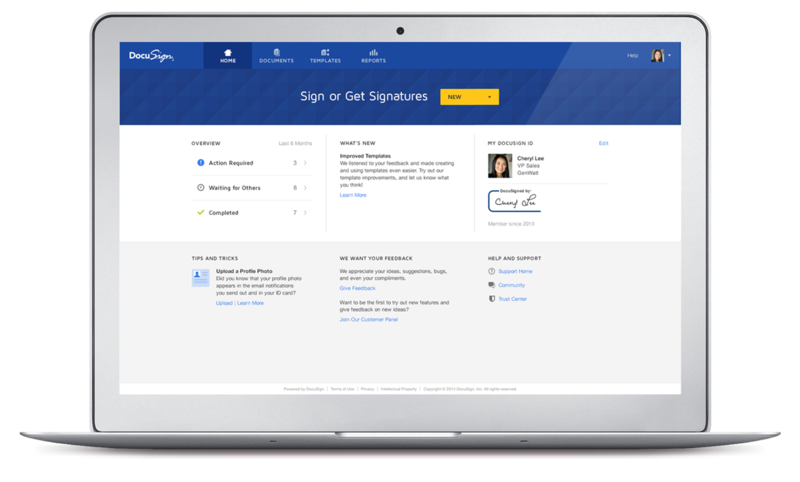 As a part of the new experience, DocuSign Administration has also been updated, and is always accessible through the URL https://admin.docusign.com. Get a state-of-the-art user experience that enables even your newest users to start sending and signing right away on an even more powerful digital transaction management platform. We optimized the new platform to help you complete everyday tasks faster. The order signing diagram offers better visualization of signing order; upgraded filters make it easy to find specific documents; audit logs and bulk actions give administrators greater visibility. Only the New DocuSign Experience includes DocuSign’s newest product innovations and capabilities, including DocuSign Payments and Standards-Based Signatures. Transitioning from the Classic DocuSign Experience to the New DocuSign Experience? Check out these resources on the New DocuSign Experience Transition Portal.